This morning, the Nonhuman Rights Project filed a lawsuit on behalf of four chimpanzees seeking legal personhood status, including Tommy — a chimp who's being kept in a cage in a shed at a used trailer lot in Gloversville, New York. 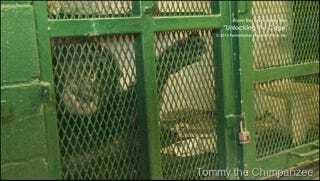 Above: Tommy the Chimpanzee via NhRP via Unlocking the Cage. It's the first of three suits to be filed by the NhRP this week. The second will be filed on Tuesday in Niagara Falls on behalf of a chimp, Kiko, who's deaf and living in a private home. The third will be filed on behalf of two chimps, Hercules and Leo, currently being used in locomotion experiments at Stony Brook University on Long Island. The NhRP is asking the judge to grant the chimpanzees legal personhood status — the right to bodily liberty — so that they can be moved to a sanctuary. The legal cause of action that we are using is the common law writ of habeas corpus, through which somebody who is being held captive, for example in prison, seeks relief by having a judge call upon his captors to show cause as to why they have the right to hold him. More specifically, our suits are based on a case that was fought in England in 1772, when an American slave, James Somerset, who had been taken to London by his owner, escaped, was recaptured and was being held in chains on a ship that was about to set sail for the slave markets of Jamaica. With help from a group of abolitionist attorneys, Somerset's godparents filed a writ of habeas corpus on Somerset's behalf in order to challenge Somerset's classification as a legal thing, and the case went before the Chief Justice of the Court of King's Bench, Lord Mansfield. In what became one of the most important trials in Anglo-American history, Lord Mansfield ruled that Somerset was not a piece of property, but instead a legal person, and he set him free. A clear case as to why these cognitively complex, autonomous beings have the basic legal right to not be imprisoned. New York State recognizes the continuing viability of the common law writ of habeas corpus. New York case law permitted slaves to use the writ to challenge their status as legal things and establish their right to freedom. And the state also adopted Lord Mansfield's celebrated habeas corpus ruling in the Somerset case. It's too early to say if the NhRP will win the case, but regardless, it's poised to be the first of many — including cases to defend the rights of gorillas, orangutans, elephants, whales, and dolphins. "[A]ny animal that has these sorts of cognitive capabilities, we would be comfortable bringing suit on behalf of," noted Steven Wise, the founder of the group. Frankie Trull, the president of the National Association for Biomedical Research in Washington, D.C., says her organization will fight any attempts at personhood in the courts. Chimpanzees, she notes, are important models for behavioral research, as well as for developing vaccines against viruses like hepatitis C. "Assigning rights to animals akin to what humans have would be chaotic for the research community." Anatomist Susan Larson, who studies the Stony Brook chimpanzees to shed light on the origin of bipedalism in humans, says she is "very shocked and upset" by the lawsuit. She says the chimps live in an indoor enclosure comprised of three rooms—"about the size of an average bedroom"—plus another room where they can climb, hang, and jump from ladders and tree trunks. "Everything I do with these animals I've done on myself," she says. "I understand that animal rights activists don't want these animals mistreated, but they're hampering our ability to study them before they become extinct." The lawsuit comes less than a week before the Personhood Beyond the Human conference, of which the RNhP is an official sponsor.